For twenty years Akram Khan has made a major contribution to dance through his own performances, his choreography in his own modern Kathak style and more recently in ballet, especially in English National Ballet’s reimagined Giselle. And now Khan and his producer, Farooq Chaudhry, have curated four solo works by exceptional young dance artists from their company, under the banner Portraits in Otherness. As Chaudhry points out they are repaying the consideration that they received when starting out two decades ago. The two solos in the second of the programmes featured dancers we saw in Khan’s phenomenal Until the Lions at The Roundhouse: Ching-Ying Chien and Joy Alpuerto Ritter. Chien from Taiwan, a powerhouse of dance training, is an exceptional dancer, winning the Critics Circle award for Outstanding Performance (Modern). She describes how she was attracted to a myth that nobody sees the body of a deceased vulture and uses this as a launch pad to “explore the life cycle, flaws and triumphs of the human, but through the eyes of an animal.” At first, we see a tall figure is a huge cloak of blue material stretching out to the corners of the stage. 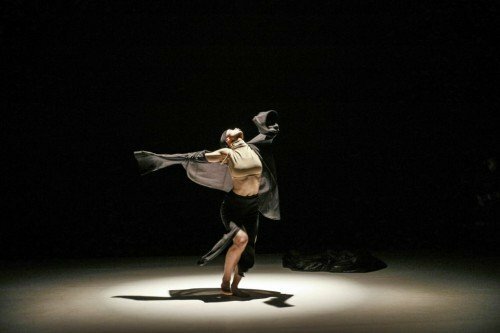 As the figure moves away from the front of the stage, slowly shedding the cloak, we see a body under the garment and eventually Chien emerges in birth. Wearing a jacket giving the illusion of wings and initially on the floor, then her knees and then upright, in slow movement, she creates strange, fascinating shapes, using her extraordinary plastique. At the end of life cycle Chien casts off her shawl and returns to the floor. While innovative and sometimes mesmerising, linking the steps to the theme was not straightforward and the material was stretched at thirty three minutes and judicious editing could make the work more accessible. Joy Alpuerto Ritter’s Babae, is inspired by Mary Wigman’s iconic Witch Dance, but without slavishly following the moves from this famous Ausdrucktanz solo. Ritter brings both her Philippine folk dance tradition and contemporary training at the esteemed Palucca Dance School in Germany to bear on her creation. Moving around five pots, Ritter shows us a powerful, angry woman controlling the environment around her. Gestural movement plays an important part, her hands sometimes making sinister claw shapes, sometimes shaped as animals or spirits in conversation and conflict. With jumps, spins and rapid, assured steps, Ritter creates a convincing portrait. In a later scene, she scoops bright red sparkling dust which floats magically around her head. The performance is eye catching but like Vulture the material is stretched and five to ten minutes editing would leave it even stronger. I commend the Akram Khan Company for this choreographic initiative and hope that it becomes a regular feature in their calendar.